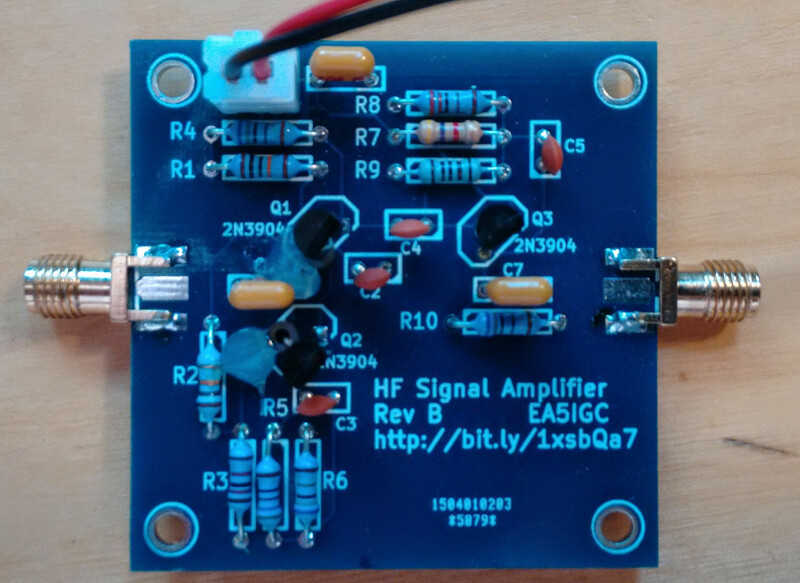 In building QRP HF radios, having an RF signal level amplifier building block is handy. You want 50 Ohm output impedance, some reasonable gain, supply voltage of the usual 10-14V and ease of building using standard parts from your parts bin. Some searching around the interwebs came up with a good idea for circuit from Aaron Parks, KC8FQD, who did a YouTube video on a WWV receiver. Choose the gain you want from your amplifier (AV), the supply voltage (VCC), your quiescent output voltage (VC1) and your quiescent current through the transistors (IC). Note that in the calculations, IC, IC1 and IE are all nearly the same value. So, let’s say exactly the same value. The trick with the design is to not be too greedy and ask for too much gain since we’ll end up with an oscillator, not an amplifier. Since we are amateur radio enthusiasts, we choose a supply voltage of 12.5V. For this exercise we would like a gain of about 10 across the HF bands (500kHz to 30MHz). 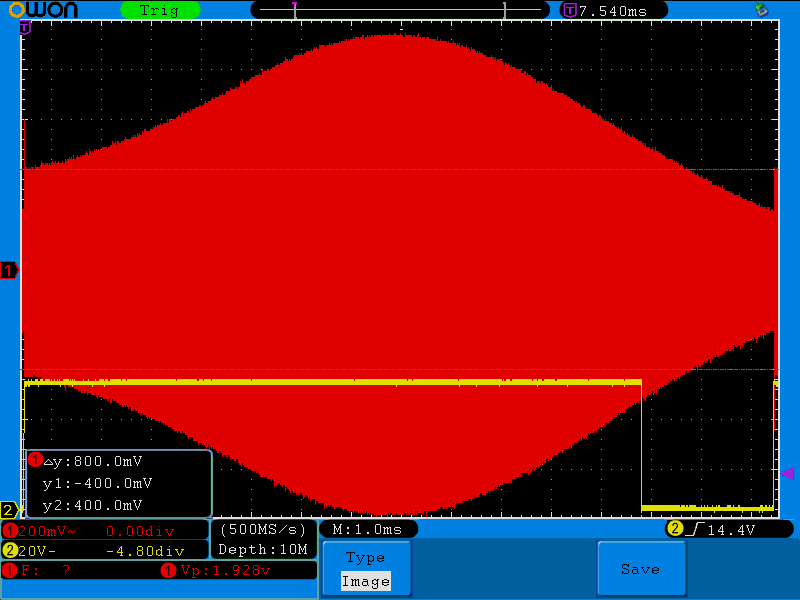 A moderate quiescent current is recommended for decent bandwidth, so shoot for, say IC = 1mA. 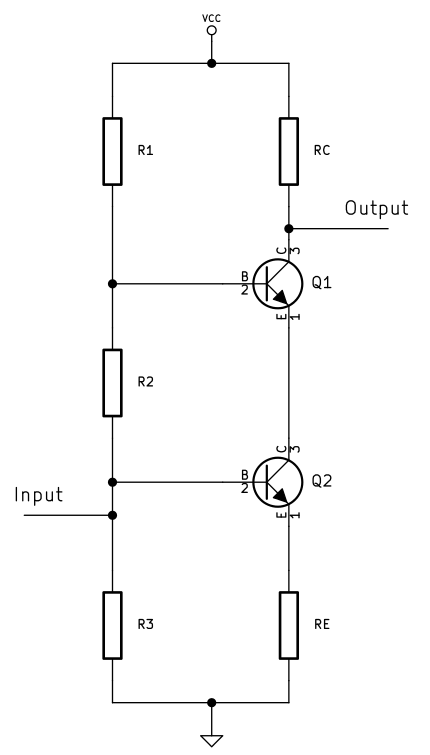 For a maximum possible voltage output swing, we set VC1 at 6.2V for quiescent conditions. I used KiCad to enter the schematic (again, after also putting it into LTSpice!) and lay out a 2-layer PCB – the bottom side being a ground plane. I really like those SMA PCB edge connectors. As I read it, the lower frequency gain is around 8x, has a peak (around 4MHz) of around 25x and the lowest gain (taken with a pinch of salt because that’s the limit of my signal generator O/P which might be 3bB down at the limit) of around 5x gain at 25MHz. That’s pretty much as I expected from LTSpice (if memory serves me correctly!). So the gain isn’t flat across all HF, but if you’re working within one band as one usually does on a homebrew QRP radio, that doesn’t really matter. 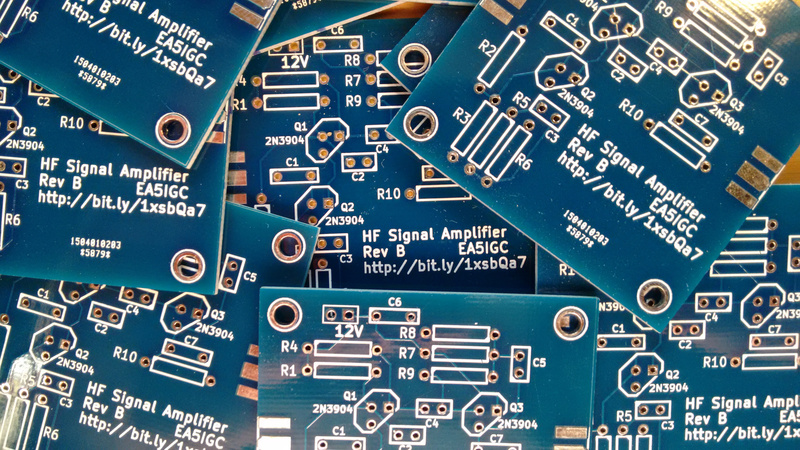 The parts for each amplifier come to around €3, including PCB and those fancy SMA connectors. I guess you could chain these together to get the gain you want if you need more than ~10x. A Rev C board might have the +ve supply brought out to pads on the same offset left and right of the board to make a chain of boards look really neat and tidy inside your QRP build. I have a few PCB’s to give away – I won’t give them all away since, as I said, this is a basic building block and in some projects I might use several. Use the Contact link above to see if I have any left – and if you were to send me a few dollar bills to cover my costs, that would be mighty kind. If you’d like to order some boards for yourself, they’re just $14 for (at least) 10, delivered from Dirty Boards PCB’s. Here’s the link to order. I sent a board to Alan Wolke W2AEW and he made one of his excellent videos on cascode circuits. Thanks again, Alan! I also sent one to Aaron KC8FQD who was also kind enough to build it and make a nice video and analyse and fix an error in the output buffer. Aaron and Alan: smarter than the average bear.